Farmstead Arts presents lectures on a variety of topics including history, preservation and the arts. Lectures are held in one of our beautiful galleries in the historic Farmhouse at Farmstead Arts. This intimate environment invites the listener into the heart of the narrative, creating an informative and entertaining experience for all. A reception is held after each lecture with refreshments and an opportunity to meet and talk with the presenter. Why was tea so important in the lives of 18th-century people that fashion-conscious families posed for portraits with their tea sets? 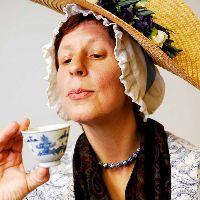 Did Great Britain lose her American Colonies over “the cup that cheers?” Find out in this unusual costumed presentation of tea lore, history, songs, poetry, living history display and demonstration.